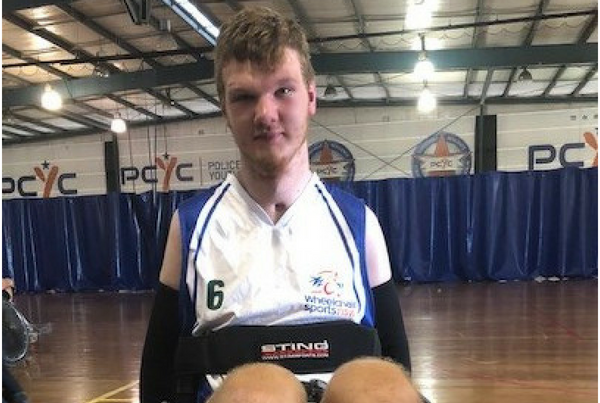 Alex Partington and his family approached the John MacLean Foundation to help fund a sports-adapted wheelchair so he could play rugby following a major spinal cord injury caused by bicycle accident. Alex lives with his parents and one sibling in Springwood in NSW. He has Asperger’s Syndrome and previously struggled in social situations. Prior to his accident, Alex played basketball up to four times a week with a local team which greatly developed his ability to relate to others and play as a team member. His injury resulted in quadriplegia and months of rehabilitation in hospital and at home. He has some movement and is working well on developing his mobility. Alex could no longer play basketball but he found he could manage wheelchair rugby so joined a team in July 2017. Alex really enjoyed rugby and he found he could still socialise with other team players of both genders (and similar injuries) which continues to aid his personal development and motivation. Alex soon outgrew the rugby club supplied wheelchairs. At six foot eight inches tall and still only 16, he needed an adapted chair to meet his physical needs and support his success in the sport of wheelchair rugby. JMF is delighted to be able to help Alex, and together with funds raised by his family and the local community, provided approximately $7,000 towards the cost of Alex’s $10,000 new chair.